The Oregon Department of Environmental Quality has determined that dealing with Styrofoam structures on the St. Helens waterfront, which has prompted complaints from people concerned about its deterioration, is a matter best dealt with by local government. 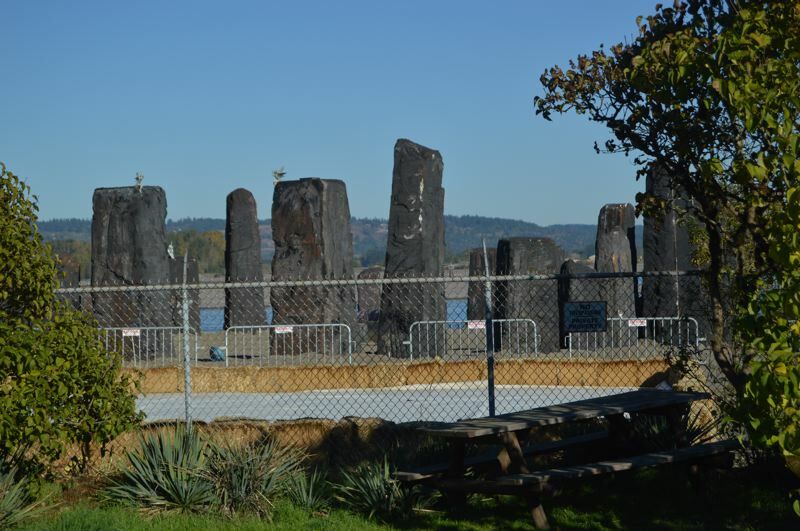 In early October, DEQ received an anonymous complaint about the Stonehenge-like structures and conducted a site visit on Oct. 12.
ing its evaluation, DEQ is deferring the complaint to the city. "DEQ has determined this is a local government issue, and has deferred the complaint back to the City of St. Helens to resolve," she said. The structures, which were first acquired by the city of St. Helens last fall after being used on the TV show "Grimm," which was filmed in Portland, gained some attention this year by residents and business owners concerned about the props deterioration as they continue to be used for various events. Last October, the props were used for a Spirit of Halloweentown attraction, and then reused in the spring for a May Day-style event, the Festival of the Fairies. At the time, Patricia Forbes, owner of A Tinker's Marketplace on Strand Street, organized a petition to have them removed from the city's waterfront property. When the structures reappeared in late September for a second Festival of the Fairies, Forbes renewed her petition. Thomas O'Hanlon, a St. Helens resident who also runs a political action group called the Progressive Alliance of Columbia County, also helped launch an online petition to remove them. O'Hanlon has also been active in recruiting support for the removal of the structures. He has been in contact with Portland news agencies, the Oregon State Marine Board, and the Oregon League of Conservation Voters to discuss the issue. Recently, he also reached out to the Oregon Governor's Office of Film and Television and got in touch with a prop designer, Tim Oakley, for added perspective on the props. Oakley, who owns his own studio in St. Johns, also works with the Scappoose-based Michael Curry Design studio. He worked on the set of "Grimm" for the first three seasons of the show, but was not on set when the Styrofoam structures were designed. Based on photos he was shown and images shared in local media, Oakley said he was surprised the props had been used longterm due to their hollow-form foam composition. "This particular foam is usually made for boulders and cliff sidings and it's a one time use only," Oakley explained. "Normally foam that has longevity is pink or blue and is insulation foam which is ten times more dense." St. Helens City Administrator John Walsh, however has noted that the city views the props as valuable assets which it hopes to maintain to be used long-term. "They're valuable assets and we want to take care of them," Walsh stated. Walsh and city-contracted event planner Tina Curry have indicated that the structures will be coated with fiberglass now that the Festival of the Fairies is complete to help prevent further deterioration. "I expect Halloween props and all Festival of the Fairies props to be put away in the warehouses within 10 days," Curry stated in part in an email to the Spotlight on Wednesday, Oct. 31. "We are fiber glassing the stones as planned so we can use them for the future and they will be completely covered as planned and stated by professionals in the area."